The American Cancer Society notes that more than 2 million cases of skin cancer occur annually in the United States - that's a higher figure per year than all the other cancers combined. It's also a fact that 80% of lifetime sun damage occurs during childhood and sunburns in childhood are linked to skin cancer in adulthood. You can limit sun exposure somewhat by avoiding the sun during peek hours (10am to 4pm) and have your child wear protective clothing, but honestly these tactics aren't enough. Your child also needs to use safe sunscreen. The correct way for a child to wear sunscreen is to wear 1/2 ounce to one ounce of sunscreen whenever he's outside (year-round, not just in summer) and it should be re-applied every two hours. 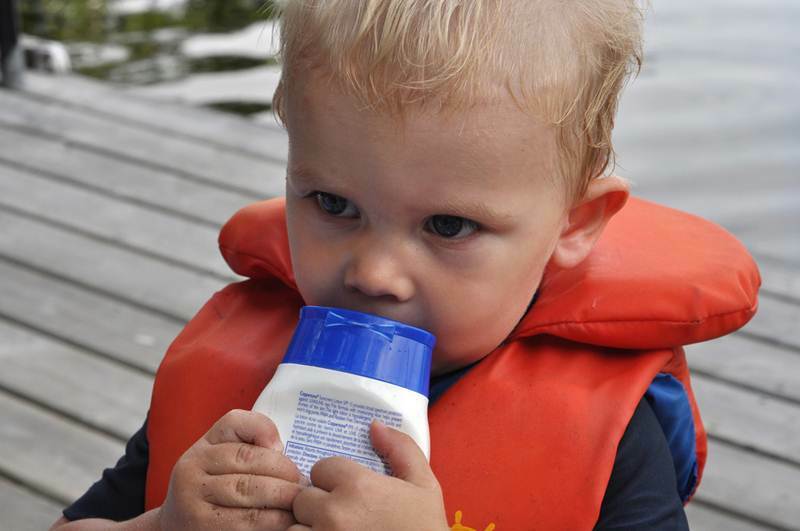 Your child needs sunscreen because he should be outside playing often. Outdoor play is healthy for kids - at a super bare minimum of 10 hours a week. Between time outside and proper sunscreen applications, your child needs 130-260 ounces of sunscreen per year. If your child is using less sunscreen either he's not outside enough, you're not using enough sunscreen or you're only letting your child outside at night (which we don't recommend obviously). Kids should be allowed to be kids, which means a healthy dose of outside play, even when it's sunny. Keep reading to see how much safe sunscreen really costs and see our favorite more affordable, safe sunscreen options to try. As a green parent you know your child needs to play outside but you also don’t want to slather your child in chemical sunscreen. So you shop around for safer sunscreen, only to realize how very expensive safe sunscreen can be. 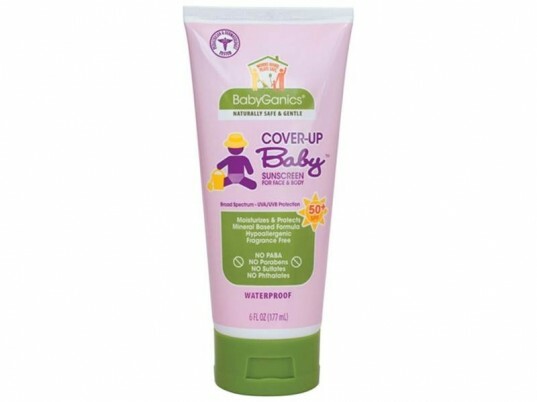 For example, EWG notes that California Baby is a very safe sunscreen, and if you read reviews, parents do rave about how safe it is, as well as the awesome consistency. However, this sunscreen is also $6.89 per ounce which is a unrealistic price for most families. Since a typical kid can go though 130-260 ounces of sunscreen per year, it’ll cost you $896 to $1,719 annually to keep your child’s skin protected. If you’re a family of four (two adults + two kids) your annual sunscreen costs will be significant since adults need to use 1 ounce (2 tablespoons or a typical shot glass) of sunscreen every two hours when outside. The total cost to sunscreen a family of four correctly (if you spend minimal time outside) is around $5,302 a year or $441 per month. That’s a ton of cash and an amount most families don’t have to spare. The situation gets worse when you realize that California Baby prices are the norm. $6-$7 per ounce is very typical for safe sunscreen, with some safe sunscreen running as high as $12 per ounce. Luckily, you can protect your family’s skin from sun damage without having to take out a major loan. This year, EWG has released a list of safe sunscreens that you can actually afford. All the sunscreens on the EWG safe and affordable list offer stable sun protection, contain few ingredients and do not contain retinyl palmitate or oxybenzone. Keep reading to see which sunscreens are the safest and most affordable of the year. At just $1.36 an ounce, this is not only sunscreen every family can afford, but it’s safe and widely available at most stores such as Target and Kroger. I’ve seen this on sale for as low as $0.70 per ounce (watch for coupons too) which makes it one of the best sunscreen deals you can find. This sunscreen is oil, fragrance and dye free, plus tear free, yet offers broad spectrum, excellent UVA/UVB protection. 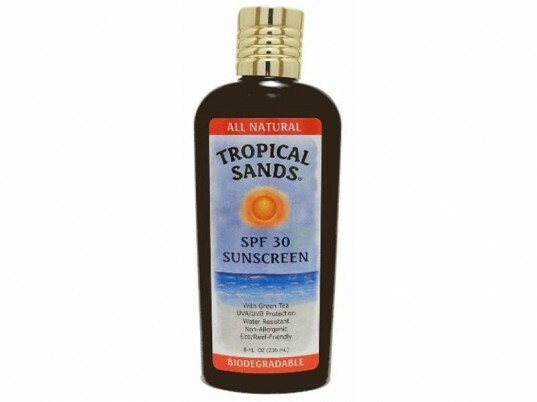 Additionally, this sunscreen comes in a larger 8 oz size, which helps to cut down on plastic waste. This sunscreen will run you $1.82 per ounce, a good deal for safe SPF 50 sunscreen. The bottles are recyclable and the sunscreen itself provides high protection against sunburn and other effects of sun exposure. It’s made with some certified organic ingredients, including moisturizing aloe vera leaf juice and is a water-resistant formula. SunStuff Mineral Lotion is one of the safest low-cost sunscreens on the market (just $2.10 per ounce), plus has other perks beside. 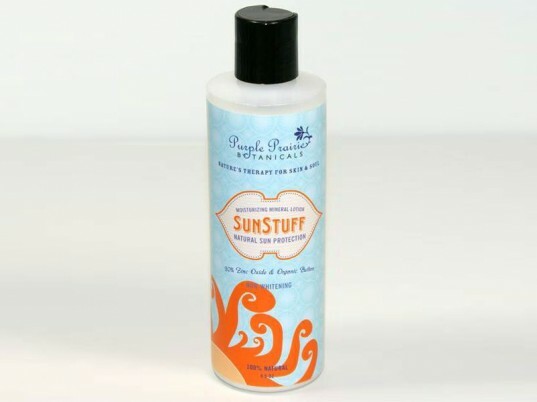 SunStuff mineral lotion has an SPF of 30 and protects from sunburn and moisturize at the same time. 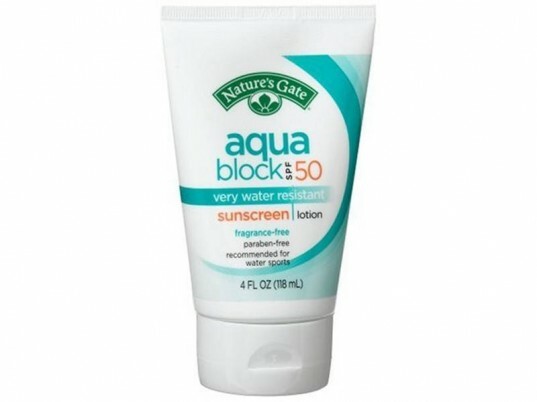 This sunblock has a great non-whitening formula which includes organic shea & cocoa butters. It’s unscented, 99% natural, biodegradable and environmentally safe plus comes in a huge 9.5 oz. bottle with flip top cap. For $1.79 per ounce you can score this safe sunscreen that offers an SPF of 50 along with broad spectrum – UVA and UVB protection. 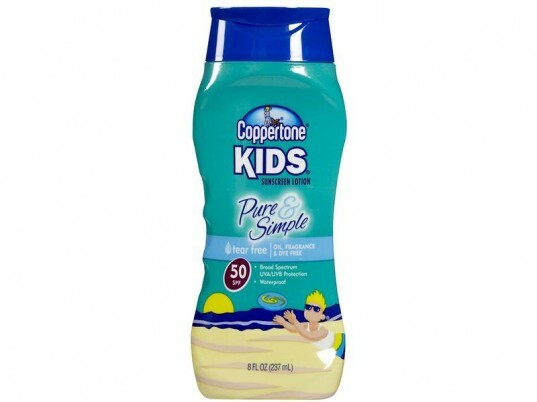 This is a safe mineral based formula that moisturizes and protects, plus it’s hypoallergenic and fragrance free. There are zero PABA, parabens, sulfates or phtalates in this sunblock. This sunscreen is around $2.24 an oz; not the lowest priced on the list, but fair. It’s SPF 30 with high broad-spectrum UVA and UVB sunblock protection when applied as directed. This sunscreen is free from potentially dangerous chemical sunscreen ingredients and is water resistant, non-allergenic, contains zero fragrances, no chemical preservatives (parabens) or emulsifiers, and is Non-Nano. Plus it’s Reef Friendly, biodegradable and less visible on your skin than some other physical sunblocks. As a green parent you know your child needs to play outside but you also don't want to slather your child in chemical sunscreen. So you shop around for safer sunscreen, only to realize how very expensive safe sunscreen can be. For example, EWG notes that California Baby is a very safe sunscreen, and if you read reviews, parents do rave about how safe it is, as well as the awesome consistency. However, this sunscreen is also $6.89 per ounce which is a unrealistic price for most families. Since a typical kid can go though 130-260 ounces of sunscreen per year, it'll cost you $896 to $1,719 annually to keep your child's skin protected. If you're a family of four (two adults + two kids) your annual sunscreen costs will be significant since adults need to use 1 ounce (2 tablespoons or a typical shot glass) of sunscreen every two hours when outside. The total cost to sunscreen a family of four correctly (if you spend minimal time outside) is around $5,302 a year or $441 per month. That's a ton of cash and an amount most families don't have to spare. The situation gets worse when you realize that California Baby prices are the norm. $6-$7 per ounce is very typical for safe sunscreen, with some safe sunscreen running as high as $12 per ounce. Luckily, you can protect your family's skin from sun damage without having to take out a major loan. This year, EWG has released a list of safe sunscreens that you can actually afford. All the sunscreens on the EWG safe and affordable list offer stable sun protection, contain few ingredients and do not contain retinyl palmitate or oxybenzone. Keep reading to see which sunscreens are the safest and most affordable of the year. At just $1.36 an ounce, this is not only sunscreen every family can afford, but it's safe and widely available at most stores such as Target and Kroger. I've seen this on sale for as low as $0.70 per ounce (watch for coupons too) which makes it one of the best sunscreen deals you can find. This sunscreen is oil, fragrance & dye free, plus tear free, yet offers broad spectrum, excellent UVA/UVB protection. Additionally, this sunscreen comes in a larger 8 oz size, which helps to cut down on plastic waste. This sunscreen will run you $1.82 per ounce, a good deal for safe SPF 50 sunscreen. The bottles are recyclable and the sunscreen itself provides high protection against sunburn and other effects of sun exposure. It's made with some certified organic ingredients, including moisturizing aloe vera leaf juice and is a water-resistant formula. For $1.79 per ounce you can score this safe sunscreen that offers an SPF of 50 along with broad spectrum - UVA and UVB protection. This is a safe mineral based formula that moisturizes and protects, plus it's hypoallergenic and fragrance free. There are zero PABA, parabens, sulfates or phtalates in this sunblock. This sunscreen is around $2.24 an oz; not the lowest priced on the list, but fair. It's SPF 30 with high broad-spectrum UVA and UVB sunblock protection when applied as directed. This sunscreen is free from potentially dangerous chemical sunscreen ingredients and is water resistant, non-allergenic, contains zero fragrances, no chemical preservatives (parabens) or emulsifiers, and is Non-Nano. Plus it's Reef Friendly, biodegradable and less visible on your skin than some other physical sunblocks.